In some point in our lives, we'll all look to create swimming pool scrapbook layouts. Whether you have a teenager that's like a fish in water or younger children who are just learning to swim, you have several opportunities to scrap your big and little swimmers. Since I'm partial to scrapping photos of my little buddies, I'll start off with swimming pool scrapbook layouts for babies. You can't have toddlers without having a baby pool. They're plastic, they're bright and they rip all too easily!! Much like my article on matching school colors for a graduation scrapbook layouts, I found the easiest place to start was the pool itself. The sides of a baby pool typically have a bright pattern, whether it be tropical fish or multi-colored circles, so why not have your layout mimic the design and/or the colors of the pool? For example, a baby pool is typically made of three "rings" – the top one being a solid color and the bottom two being a pattern. So, start with a sheet of cardstock that closely matches the color of the top ring and then create strips of varying heights (same width as sheet of cardstock) in one or more patterned papers that match the type of pattern used on the bottom two-thirds of the pool (like Junkitz Papers – Hoops or Dots). Next, we have our beginner swimmers. They're old enough to get in the pool without Mom and Dad, but not quite old enough to have mastered the backstroke. Get a picture of them with their swim instructor, the first time they jump into the deep end and perfecting the latest stroke they learned. Don't forget to use their certificate of completion as an embellistment for your swimming pool scrapbook layouts. Also, as part of your journaling, indicate where your children took their swimming lessons and how old they were. Finally, there are those children that you just can't pull out of the water...and they turn into lifeguards. If you have a new lifeguard in the house, create a swimming pool scrapbook layout featuring them in their new position of responsibility. Get a picture of them on their first lifeguard duty shift and use a copy of their lifeguard certification as an embellishment. It might be a nice change to use black and white film or change your digital photos to black and white and use the traditional red and white lifeguard colors for your scrapbook layout. The black in the pictures will be a perfect complement to the red and white. Some things to think about including in your journaling are… Why did they want to become a lifeguard and/or what pool(s) they guard at (the YMCA, county fitness center or community pool)? Check out my Pool Time Alphas. The blue swirl of this chunky alphabet is a great complement to the theme. 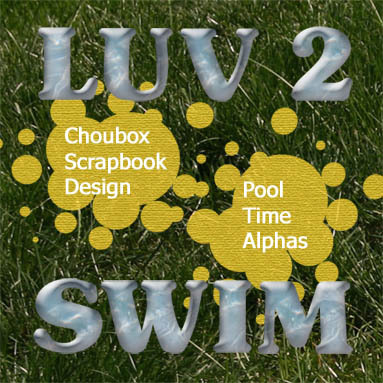 The Choubox Pool Time Alphabet includes Upper Case and Numerals. Each character comes in a separate *.png file. All files are 300 ppi. A great value at only $1.00! To see an example of a layout using this alphabet, click here.